For this reason we started a long time to use for backup via WAN Burp, an open source backup solution that has the ability to continue interrupted backups. In this post I’ll show how to compile/install & configure in Debian 7. After that it is possibile start the burp server with this command. Now we have to install/configure burp in windows client named adc-infpressapochista: we need to create a file in /etc/birp/clientconfdir named adc-infpressapochista. # (without the leading '# '). 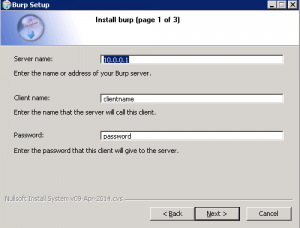 Now we can install & configure burp windows client. 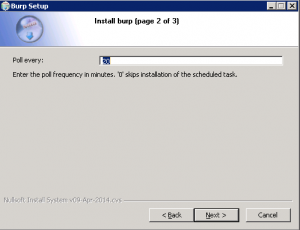 This is the poll time that client contact server: I’ve modifed in 60 mins. I think that is auto-explanatory: I’ve modified like that. At the end we can try to start burp client to check if all works fine. Now we can configure the client folder to backup: in the client (but it is possibile to modify in server config file too) modify C:\Program Files\Burp\burp.conf. we’re done, but I would like to share other parameters involved in burp server. option on the server. 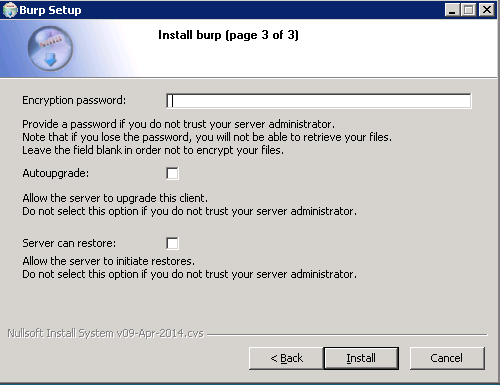 Using resume param simply continue the previous backup from the point at which it left off. #At what time we want to start the backup: in my config every 60 min the windows client pool the server. If the hour is in this option the backup will start. To check the server status we can use this command.